We’re more affected by our calendar rhythms than we realize. While it is easy to dismiss that the turn of the year is simply just another date on the calendar, something inside of us understands that there is something more. The rhythm of the new year always brings a sense of hope, of promise, and of change. It’s because of that “inner sensing” that we make New Year’s resolutions. It is time for a change. it is a time to right some wrongs. it is time to correct the course of our lives. It is time to experience something new and life giving. it is time to free our lives from those things that rob us of life. God’s people have long had this sense of making a change at the turn of the year. The Jewish Feast of the New Year (Rosh Hashanah or “The Feast of the Shofar” in Lev. 23:24) preceded the High Holy Feast of Yom Kippur (the Day of Atonement; Lev 16:29). In the interim time between the two feasts (10 days – called “the Days of Awe”), each person was to examine themselves, make amends to those they’ve offended, and seek God for forgiveness from sins. The idea was that on Yom Kippur, God would forgive their sins through the conferring of those sins on an innocent animal. As a result, the people could live their lives “rightly” in the new year. As Christ followers, we believe that Jesus Christ is the innocent that “takes away the sin of the world.” Also, as Christ followers we believe that we are constantly in a state of transformation; of surrendering ourselves to God in worship, of making choices to live rightly, and of His power and grace enabling us to do so. So making resolutions to live better for God comes naturally for us! Even more so in the built-in rhythm of the new year. However, what every person faces is the challenge of finding “resolve” for our resolutions. 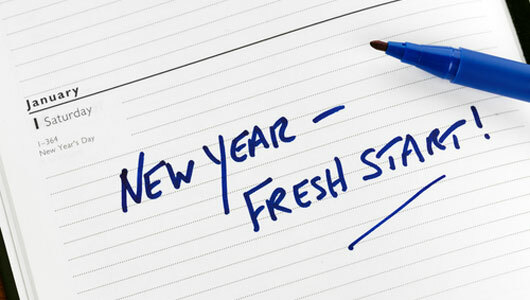 Most people fail in keeping resolutions; including (sadly) those who follow Christ. One considers it a major success if they can keep their resolutions for a month. Keeping a resolution for an entire year (much less, a permanent transformation) is a pipe dream for most. In fact, many (including and especially Christians) refuse to make New Year’s resolutions; mainly, because they know they will fail! And I find that sad because, as Christ followers, we should be examples to the world of what life transformation really is. I claim to be no expert in keeping New Year’s resolutions. But Whole Life Worship has taught me a lot about true transformation, and I’ve gone through some of that in my life – as I know most of you have also experienced. What if we used Whole Life Worship principles and combined them with the rhythm of the New Year? What if we, like the ancient Israelites, took serious stock of our lives and leveraged the power of atonement with the power of new beginnings to produce a life that is markedly different from “last year”? Over the next few posts, I want to explore some of the dynamics of Whole Life Worship transformation and see how we can gain more resolve for our resolutions – resulting in changed and enriched lives. Success in whatever we do is fundamentally related to our commitment to God. Think on that for awhile. 1. Have you made a New Year’s resolution? Why or why not? 2. How is God involved in the making of your resolutions? 3. What is something you would do if you knew you couldn’t fail?